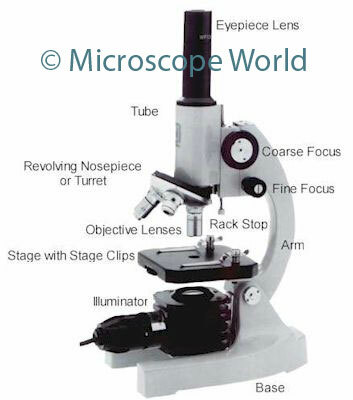 This image shows the parts of a student microscope. The fine focus helps to get fine-tuned crisp and clear images in your field of view. Some microscopes only have a coarse focus knob, which makes focusing at higher magnifications a bit harder. Notice the rack stop, right behind the objective lenses. This ensures that when looking through the eyepiece while focusing, you do not accidentally run the objective lens into your slide and damage the lens or the slide. More detail on each of the parts of the microscope listed above can be found here.